Please send me more information on Rissalena Motorboat Cruises! A custom-designed 37' power catamaran for groups up to 24, the Rissalena is a guest favorite for a day on the lovely waters of Los Cabos. Reserve a sightseeing adventure with your friends, associates and family for a one-of-a-kind cruise experience. Experience an unforgettable day at Land's End, as you cruise to a breathtaking vantage point overlooking the dramatic rock formations and the arch of Cabo San Lucas. Or dive into the aqua depths of Cabo San Lucas Bay on a snorkeling adventure. Skim the reefs and experience the brilliant colors of tropical sea life. First time snorkelers? Not to worry! The captain and crew will instruct and guide you. 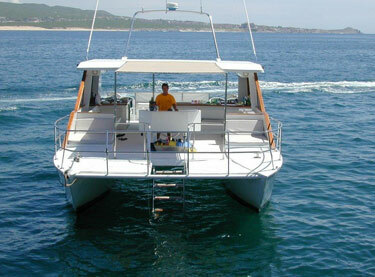 Or conclude your day with a romantic Cabo sunset cruise, admiring the breathtaking views as you enjoy a delicious buffet. Whatever your choice, you'll relax with the personalized attention of the experienced crew. Your comfort, pleasure and safety are the crew's priority. LUNCH MENU*: Chicken, potato salad, seasonal fruit, salsas and chips, and fresh guacamole. Enjoy ice cold Coronas and a well stocked open bar. Snorkeling gear included. A cruise around the bay to view the migrating whales! Sunset cruise times vary according to daylight savings and sunset time. Enjoy the beautiful shoreline of Cabo San Lucas on the way to Land's End and the Pacific to admire the magnificent Cabo sunset. DINNER MENU*: BBQ ribs, vegetable rice, salsas, green salad and fresh guacamole. Our open bar provides the smoothest margaritas ever, imported Chileno wine, and more. Enjoy the shoreline of Cabo San Lucas and the beauty of the bay. Includes open bar and food. Tax and Gratuity are not included in the rate. Preloading begins 30 minutes before each tour. Tickets must be purchased in advance through our office.